A ticket with great deals!! 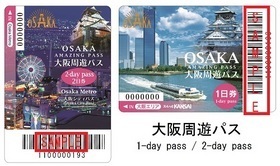 To use the Osaka Amazing Pass, you’ll need the transportation pass, the guidebook, and 'Toku×2' coupons. 1.Use the pass and get on trains and buses. When you let the pass go through the automatic ticket gate, you can ride unlimitedly all day (or 2 consecutive days for a 2 day pass) on that day! It allows you to travel easily, so enjoy going around many areas. *The use starts from the first train and ends at the last train on the day(until the last train of the following day for a 2 day pass) of use. Not for 24 hours (1 day pass), 48 hours(2 day pass) from the first use. 2.Visit facilities with your transportation pass. *However,free admission to each facilities is limited to once per facility. The use of trains and buses and free admission to facilities are limited to the same day/2days. 3.Get special offers at famous spots. * 'Toku×2' Coupons are available for use until April 30, 2019. * In some places, you can just show your pass! * For use of coupons on later days, you must also present the pass. 4.Receive special offers at restaurants and shops. When you go shopping or have meals, just show your transportation pass or submit the 'Toku×2' coupons to receive various privileges. * For use of coupons on later days, you must also present the pass. Please keep them together. The special offers of facilities and shops is valid until April 30, 2019.